I went through some of my old pictures and found a number of pictures with fire. Fire and people. But don’t worry – they’re being safe. So, I’m thinking about starting a new project – a series of self portraits, probably in somewhat obscure locations. This a project that’s been in the works for a few months now. So my girlfriend collects rocks. It’s been a topic of debate occasionally (I’m not big on nick knacks). Most walks in the woods/on the beach/around a field result in overly heavy fanny packs. I’ll admit I complain occasionally. That said – I take back all my whining. Rocks are pretty cool. Did you know obsidian is actually translucent? Because it’s volcanic glass, and whatnot, you can shoot light THROUGH it. My gal showed me that… so if you did know, don’t rub it in… OH! Did you also know that shiny, multi-colored colored one is a massive pain to shoot. See – the problem with a dark, crystalline rock that reflects at every possible angle, it that you have to find that one, single, solitary, PERFECT spot for the light. It’s irksome, to say the least. So, here are some rockin’ pics. Because these are generic enough, I decided to put them on my fine-art site, JonKArtogrphy. Stop by and pick up a print if you’d like. Shooting ad photos. It’s theraputic. I always like building little sets. I did one with a drawing figurine (that’s for a later post). It’s fun because of the details. OK it’s also a nightmare because of the details; but when you get to the end and can say that you hand crafted every single insignificant piece of the image, it’s just a good feeling. I wanted to shoot an ad. Lucky for me, the alcohol industry puts out a new flavor of something or other every 12 hours or so (that may be an exaggeration, but not by much). Anywho, it afforded me the opportunity to come up with a project for myself that hadn’t been done before. … Now, before I continue, I must say – when it comes to liquor, I’m a purist. If it’s already good, don’t mess with it. 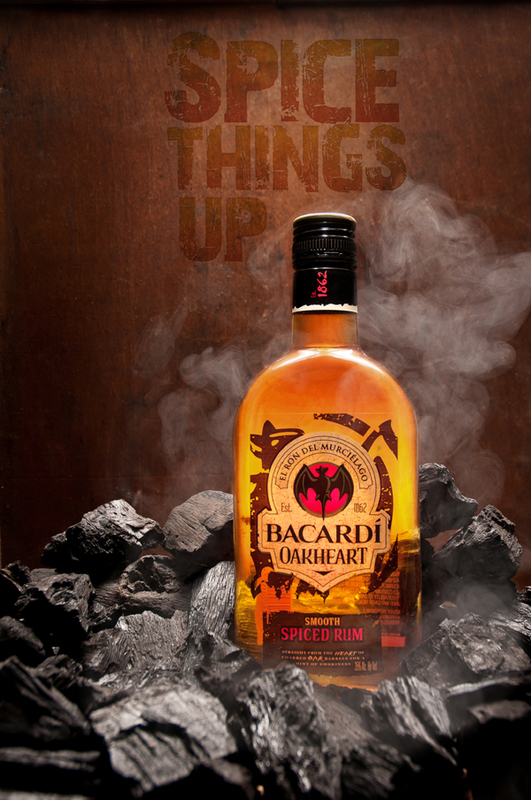 Bacardi pulled off something special here. 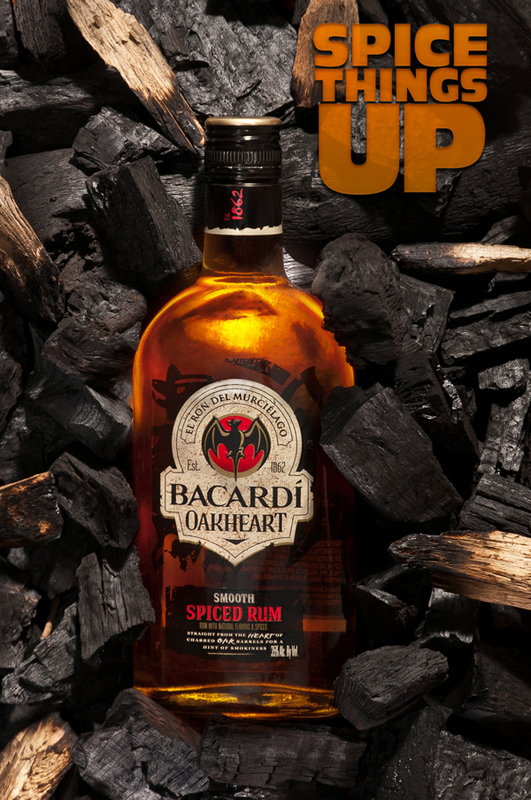 If you’re a spiced rum kind of person, you should go try it…. actually you should try it while you finish this post. It would really enhance the experience…. but I digress. I wanted to make an ad and to do so, I tore through an ENTIRE bag of charcoal to find/make just the right pieces. Those chunks of wood – scavenged from a tree that was recently “chipped.” Spent an hour getting the blackening “right.” ARTS AND CRAFTS, PEOPLE. So take a gander and see what you think. I like the top one, everyone else likes the “smokey” shot. Comments always welcome. Let’s start off with some good wholesome fun! Alright folks – It’s time to kick off this shindig with some current work. For the past number of months (maybe 4 or 5, but it’s really irrelevant) I’ve been working with a local bowling center to spruce up their image and show the community how super-totally-completely-awesome a night of bowling and togetherness can be. If you are in or around the Commerce, MI area and want to go out for the night, swing by Wonderland Lanes (http://wonderlandlanes.com/) and be sure to meet Dave, the owner. He’s awesome. Sirs and Ladies – Welcome to the most awesome blog ever created. Howdy folks. My name’s Jon Kopacz and this here’s my blog. I’m a portrait, product, and promotion photographer in south eastern Michigan. The majority of my clientele consists of local businesses and groups looking to do some marketing. As such I regularly work on a lot of unique and unrelated projects. Anyway, if you look around, you’ll find a rotating collection of previous stuff I’ve worked on as well as current projects. You’ll also find some of the fun stuff I do on the side. There will even be posts on interesting goings-on in the photo and design community. Of course be sure to stop by my collection of “people to watch.” Either seasoned pros or up-and-comers, these folks know their business in a wide range of endeavors. That’s all for now, but be sure to swing by soon. Lots of fun coming your way.